*LAS VEGAS -The Soul Train Awards will move into its new home at PH Live inside the Planet Hollywood Resort and Casino Las Vegas, November 8-10, 2012. On November 8, Centric will commemorate the Soul Train Awards’ Silver Anniversary in the Silver State. Hosted by the star of TV Land’s “Soul Man” and one of the Original Kings of Comedy, Cedric the Entertainer, stars will align, taking center stage to be recognized for their contributions to the music industry at the Soul Train Award ceremonies. They will up the ante this year by incorporating both comedy and music concerts for fans to enjoy. Centric’s plan to keep the Soul Train Awards Weekend in Las Vegas is a win for the City of Las Vegas as approximately 35,000 weekenders will equal more than $23.6 million in non-gaming revenue, almost $15.7 million in gaming revenue according to the 2012 Visitor’s Study conducted by the Las Vegas Convention Visitors Authority. “We are honored to be the new home of the extraordinary Soul Train Awards Weekend and appreciate the efforts of Centric to include our great community,” said Las Vegas City Councilman Ricki Barlow. “It is always my interest to entice organizations and festivities to the City of Las Vegas which provide meaningful economic impact for our City. 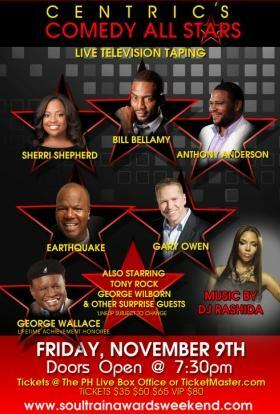 November 9, Centric’s Comedy All Stars will prove laughter is good for the soul when Anthony Anderson, Bill Bellamy, Sheri Shepherd, Gary Owens and more come together for a live taping. Centric will also recognize the lifetime achievement of Flamingo Las Vegas resident headliner, George Wallace. November 10, Soul Train Cruise presents “Soul Comes Alive” featuring live performances by Soul Train’s 2011 Best New Artist, Miguel and Rising R&B super group TGT, composed of Tyrese, Ginuwine and Tank. The 2012 Soul Train Lifetime Achievement Award honoree and platinum selling group New Edition will headline the soulful evening. 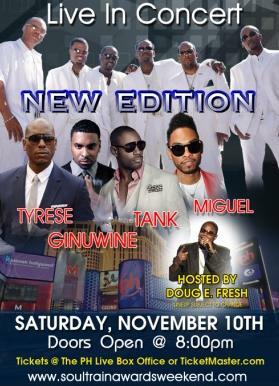 Tickets may be purchased at the PH Live box office, Ticketmaster.com and several locations throughout Las Vegas. For the full schedule of events and ticket prices visit www.SoulTrainAwardsWeekend.com.